Aerodynamic science meets hair styling – it's mind-blowing, budget-blowing and kind of awesome too. Come, let's geek out together. The Dyson Airwrap Styler spins on two words: Coanda effect. That&apos;s the airflow science at the core of the brand&apos;s newest jaw-dropping high-tech hair styling tool for creating bouncy waves and curls without the heat-related damage associated with traditional curling irons and wands. See the way the hair wraps itself around the Airwrap curling barrel without a clamp? That&apos;s the Coanda effect, in which airflow directed straight across a curved object stubbornly insists on hugging the curves instead. 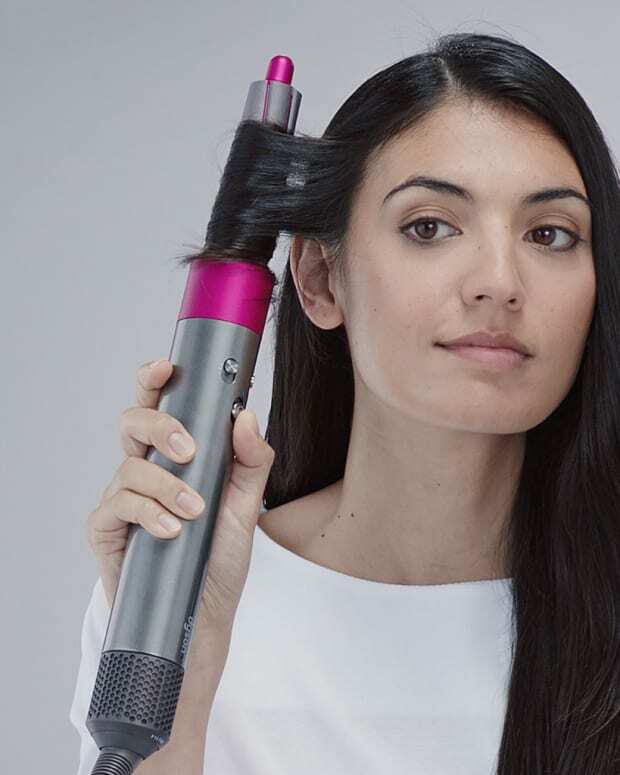 Dyson&apos;s use of the phenomenon is genius: a motor propels air from six slots around the barrel so the hair curls securely, evenly and smoothly around it. Back to the Dyson Airwrap. Like the Supersonic, the Airwrap is equipped with Dyson&apos;s "intelligent heat control." Airflow temperature is constantly measured – 40 times per second – and regulated via microprocessor to prevent it from reaching scorch levels. 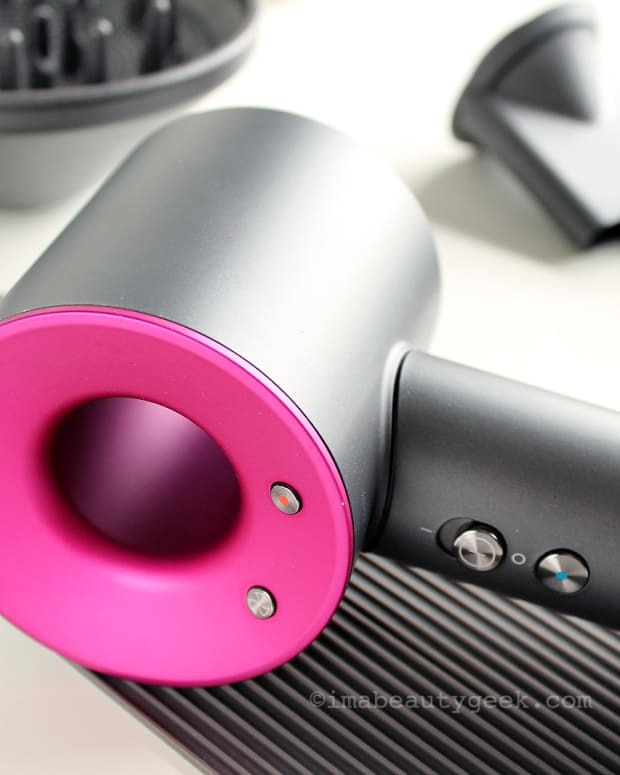 Fun fact: the Dyson Airwrap Styler reminds me of a Sunbeam multi-function hairdryer my mum had when I was a kid in the &apos;70s and early &apos;80s. Housed in a red round box with a hinged lid, it consisted of a main unit around which coiled an attached hose. The hose could be fastened on the other end to a drying cap to wear over a roller set; to a nozzle for a blowdry; and to a round brush (and a comb too?) to smooth frizz as you dry. Like my mum&apos;s old dryer unit, the Airwrap comes with attachments. A "pre-styling" dryer piece will get hair from wet to damp before you style. Brush attachments are for smoothing and boosting volume as you dry. And the curling barrels come in pairs, one to curl clockwise and one to curl counter-clockwise so you can vary your curl direction. The Airwrap and its add-on bits come in three different kits (see slideshow above). 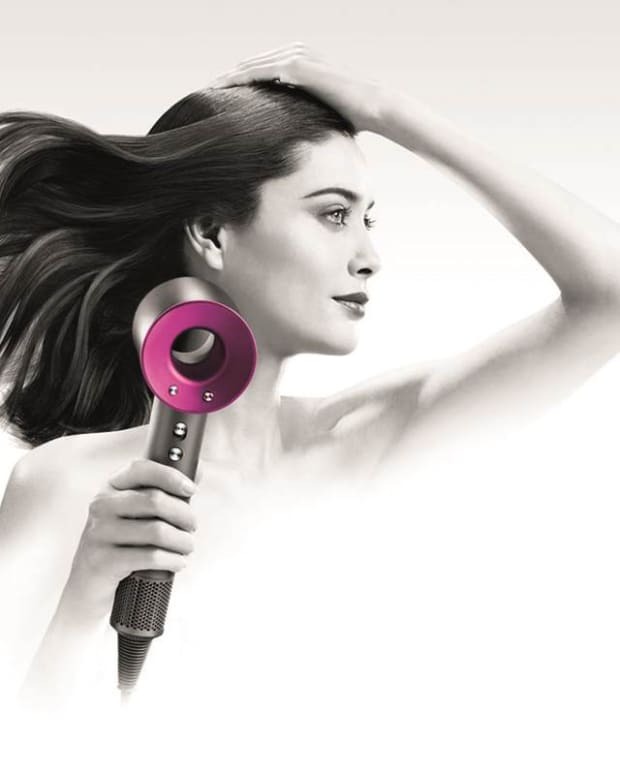 The Volume & Shape set ($599.99 CAD at dysoncanada.ca* and $499.99 USD at dyson.com*) includes attachments for thin/flat hair. The Smooth & Control set ($599.99 CAD at dysoncanada.ca* and $499.99 USD at dyson.com) includes attachments for thicker, coarser hair that tends to frizz. The third option is the Dyson Airwrap Complete ($649.99 CAD at dysoncanada.ca and $549.99 USD at nordstrom.com) that includes all the attachments. First up is a demo on how I might use an Airwrap on my naturally wavy hair. This next one shows styling with the round-brush attachment. In this video, the model goes from curly hair to straight with a brush attachment. 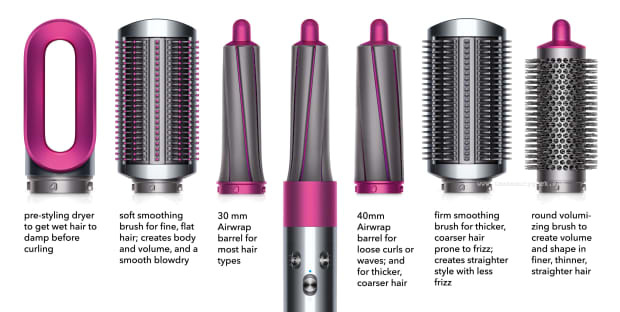 This model also goes from curly to straight, with two brush attachments. And there&apos;s this one that showcases the large curl barrel for beach-y waves.